Philipp always uses one sentence to describe how we liked India: “We wanted to stay 4 weeks. But we stayed three month.” That’s pretty much putting it in a nutshell. There are so many things to see and feel in India that (I heard that from other travelers aswell, some who stayed 6 moth, some who have been there several times and some who have lived there for years) time is never enough. 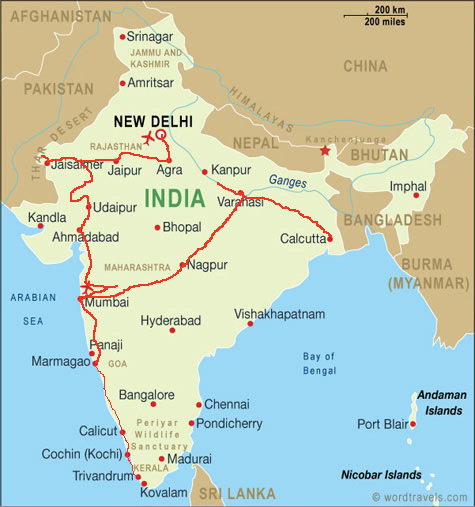 Yet you can feel you have enough of India – not necessarily seen enough but been there long enough to stress you out. (Read: Incredible India) So you might need a change. We arrived in Delhi where we spent 4 days strolling in the streets and alleys, getting into the India feeling. From there we went to Agra by train (ticket booked spontaneously at the station. It is always possible, don’t believe something different, no matter what story people tell you!) and visited the Taj Mahal. The next four weeks we spent in Rajastan, starting with Pushkar – a beautiful and quiet place with a holy lake and a famous Brahma temple. Then we went to Jaisalmer which has incredibly gorgeous architecture from sandstone. We made a great tour on camels to the desert on Christmas eve (do not pay more than 1800 RS max for two days/ one night! They try, but…). We went on to Udaipur but went slowly by busses and not the direct train so we bumped into a gigantic Fort (Kumbalghar) with a wall that looks exactly like the Chinese one (36 km long!). Udaipur is a nice but “normal” indian town except for the two big lakes. We rented bikes there, surrounded them, spent a cool new years eve and met Toni with whom we would, later on, travel all the way trough Myanmar. From Udaipur we went almost straight to Mumbai, with a little detour to the Ellora caves near Aurangabad which are pretty impressive! I just loved Mumbai! There is so much different things to see and to do. We stayed one week, visited the Dhobi Ghats, Hanging gardens, Borivali, Elephanta island, the “Shantaram” Slum and “the biggest slum of Asia” Dharavi, the Crawford markets…. and went with the public train for rush hour which is one of the most frightening things I have ever done. From Mumbai we went to Goa (Arambol and Vagator) and stayed 4 weeks because we needed a rest. We rented a scooter, enjoyed the luxury of German bakerys, Partys, western food and the beach! Philipp went on to Kerala for some weeks, where he hiked through the tea fields and floated through the rivers. I stayed in Vagator for a while and then went back to Mumbai for 10 days to get some more of that bustling city! We met again in Mumbai and went to Varanasi together by train. A unique and fascinating city Varanasi is. The holy mother Ganga with bathing and burning people, narrow alleys, colors and many people and pilgrims! There was even more going on because it was the end of the Kumba kumba Mela (holy pilgrimage festival) in Allahabad with (so the people told us) 17 Million visitors. We also went there for a day but the festival was already over by then. From Varanasi we took the train to Kolkata where we unfortunately had only one day left which we spend with all the trouble sending a parcel home (which by the way took 7 month and 3000 phonecalls to arrive. Because of several mistakes by the german post, not the indian! But to be fair: The other 2 parcels from India have been delivered correctly and in time so don’t worry.). We were “done” with India after three month and had booked flights to Myanmar (via Bangkok for the visa and a brief visit) because the country was recommended to us by several travelers and described in the most beautiful ways. Also we had met another German, Toni, and he wanted to go to the former Burma. So we decided to travel together to the country of pagodas, friendly people and water buffalos.